Let’s hope that the Iraqi-led operation can help get these kids and people out safely of Fallujah… It seems like the Iraqi forces have their act together. ISIS-held Fallujah is surrounded by Iraqi-forces, which are expected to storm the city soon. An estimated 50,000 people — 20,000 of whom are children, the U.N. says — are trapped in the city. There are reports that hundreds of families are being used by ISIS as human shields in the center of Fallujah; that men and boys who refuse to fight for ISIS are being executed; and that civilians have been killed in heavy shelling, according to the U.N.
And many experts believe that ISIS has booby traps, snipers, IEDs and other deadly surprises waiting. Some analysts say it will be a while before the terror group is driven out of the city. Hundreds, mostly women and children, fled Falluja on Friday as Iraqi soldiers attacked to drive ISIS from the city, the Iraqi military said. The Iraqi-led operation to liberate Falluja is just days old, and the city is already surrounded. 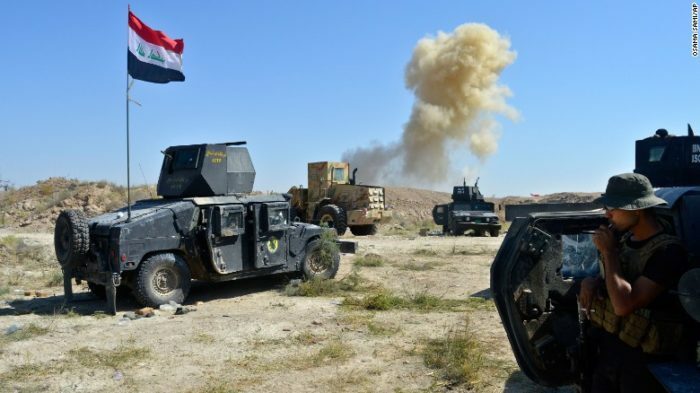 Experts say they’re surprised at the professionalism and efficacy of Iraqi forces, which were in tatters nearly two years ago.